For those of you that don’t know Ambazonia was formerly known as the British Southern Cameroons and has been in a violent struggle for independence from Cameroon since 2016. Ambazonia is the oil rich area of Cameroon that supplies 60% of the country’s income but the local people see very little of the revenue. Ambazonia is also known as the Anglaphone area of Cameroon due to it being the English-speaking area. The Cameroon Government of Paul Biya has initiated a military and police campaign to quash any political aspirations for the independence of Ambazonia. The result has led to Ambazonians forming armed militias to defend their communities from attacks by the Cameroonian Government forces. 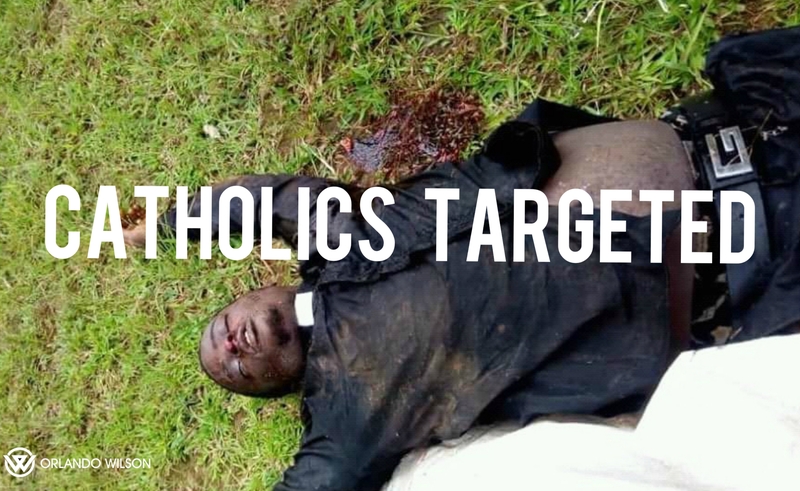 In the last 18 months it appears members of the Catholic Church in Ambazonia have been high on the target list for Cameroonian Government forces. The struggle for Ambazonian independence is not a religious struggle as Cameroon is a 70% Christian country and the Muslim communities are in the North of the Country. The Cameroonian Government clearly sees the Catholic Church and Clergy as a threat due to their work within the communities that have suffered the worse from their attacks and human rights abuses. There are witness reports of Catholics being told that the reason they were being beaten and executed was because of the churches supported the independence on Ambazonia. Below is a brief list of the attacks and murders of Clergy and Missionaries who have been targeted by Cameroonian Government forces recently. Father Augustine Ndi a priest serving with the Mamfe Diocese at Nguti who openly backed the restoration of Southern Cameroons independence was mysteriously found dead in his room, he had no health complaints and was reported to be fine by the last people to see him alive. In May 2017 Father Abbé Djama a rector of the Minor Seminary in Bafia was also found dead in his room. He also had no heath complains and there were no signs of an attack or suicide. On May 31st 2017 Bishop Jean Marie Balla was reported missing with local reports stating he was kidnapped, his body was found a few days later in the Sanaga river. Initial reports and autopsy results stated his body showed signs of torture, but a second Interpol funded autopsy stated there were no signs of torture… Reports are that Bishop Jean Marie Balla was kidnapped and killed as he was about to expose government involvement in the death of Father Abbé Djama. Father Innocent Okeke a Nigerian Priest seconded to the diocese of Mamfe and the pastor of the Holy Name of Jesus parish, Ossing was arrested and stripped naked by soldiers. He was arrested with members of his congregation outside of his church after morning Mass and taken by the military. Sources close to the military say that the Priest was only released after the intervention of Bishop Andrew Nkea and political figures. Reverend Father Alexander Sob Nougi the Parish Priest of the Catholic Church in Bomaka was reportedly killed in crossfire between Cameroon government forces and gunmen in Muyuka, he was left bleeding in his car for three hours before being removed from the scene. Father Jude Tar a former Abbot of the Cistercian Monastery in Mbengwi and serving as Parish Priest at Njinikom Parish was hit in the leg by a stray from the Cameroon military while driving in his car. This was another incident of a member of the Catholic Clergy being hit by crossfire during a military clash with supposed gunmen. Apostle Isaac Attoh a Ghanaian missionary was gunned down with two other Ghanaians by Cameroon Government soldiers and dumped on a sidewalk in Batibo. Initial family efforts to retrieve the bodies for burial were unsuccessful, as the military was unwilling to release them. Reverend Sister Roberta Ankuhag Feh a Calasanzian Sister of Daughters of the Divine Shepherdess was shot in the legs by Cameroon Government soldiers. She had been visiting family in Njinikom when shooting started and she sought refuge in a nearby house, Government soldiers entered the house and shot her in the legs before leaving. Seminarian Gerald Akiatah was shot and killed by Cameroon Police at the Catholic Church in Bamessing. He stepped outside of the church after hearing gunshot and was confronted by police who beat him and then shot him in the back and neck. He was told he was going to be killed due the churches support for the independence movement. Pastor Charles T. Wesco an American missionary was shot in the head and killed by a stray bullet during a shootout between Cameroon Government soldiers and supposed gunmen. Pastor Wesco was killed while sat in a car with his wife, one of his children and another missionary outside the town of Bamenda. Father Ondari Cosmas Omboto a Kenyan Priest and the Parochial Vicar of the St Martin of tours Parish in Kembong, Manyu was killed outside of his church. He was shot twice by Cameroon Government soldiers who were shooting form their vehicles are they drove through the town. The Cameroon Government is a close ally of the US & France and as it undertakes a terror campaign against the Anglophone community and those seeking independence for Ambazonia the worlds media and human rights organizations are choosing to look the other way. Why? Because there is no money or glory in it for them… On a positive note, it is good to see the Catholic Church is holding true to its Christian values and supporting those in need when they need it most! I would like to thank a spokesperson from the Ambazonia Foundation for supporting information for this article.